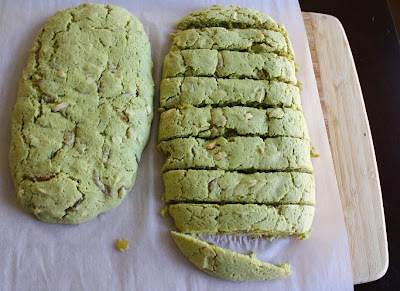 At one time in my (single) life I subsisted on two things: biscotti and green tea. I was barely making ends meet living in an apartment I couldn't afford and working at an art gallery that over promised and under delivered. You would think that under those circumstances that I'd be miserable. I wasn't. I was struggling but happy. I found joy in the smallest of luxuries, one being Nonni's Biscotti, Cioccolati. Nowadays, when I find myself with biscotti in hand, it takes me right back. This biscotti is unlike any I've ever made. 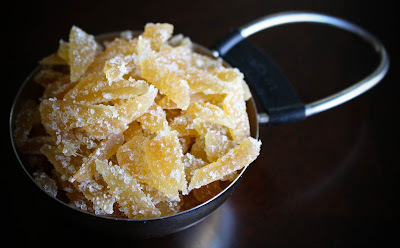 When I found out the secret ingredient for December was ginger, I knew I wanted to do something a little unexpected. 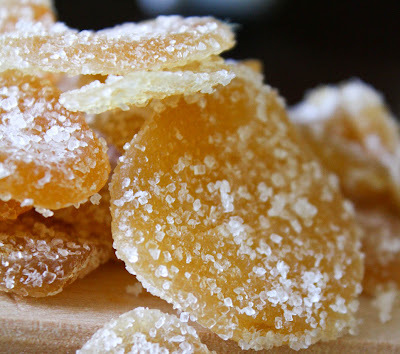 I had bookmarked a biscotti recipe long ago that contained crystallized ginger, but it also contained ground ginger in the dough. I wanted to skip the gingerbread base all together. 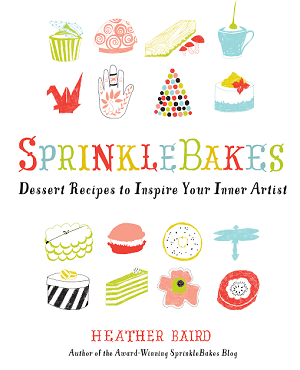 After lurking in a couple of favorite blogs (foodbeam and lovescool) I found my inspiration. Matcha green tea. Merging two things that I love so dearly...good idea or potential travesty? I would soon find out. The type of matcha I used is called Matcha Milk. It consists of matcha powder, nondairy creamer and sugar. 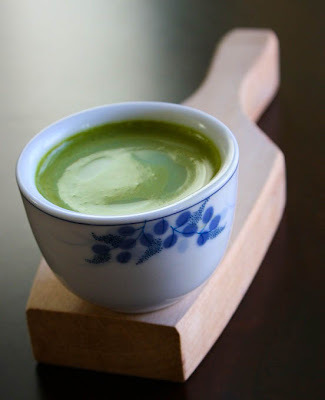 It is milder in flavor than plain matcha powder, and delicious served hot or cold. I consider it a gently sweetened green tea latte. It can be found in the usually extensive tea section at most Asian markets. Chopping the ginger finely is key. Even though the ginger mellows as it bakes, you still don't want to get a big chunk in your mouth. 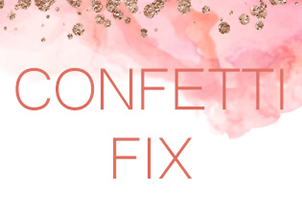 It can be a bit overpowering, so keep the pieces very small. I wasn't sure what the matcha milk would do to the batter. I was glad to see that it blended into the dough perfectly without changing the consistency. I forgot to mention that this recipe also contains toasted slivered almonds. You can see them in the baked dough here. I was growing impatient at the thought of icky-tasting biscotti so I sampled a piece before the second baking. I was so relieved. The flavor was smooth, very tea-like, and not bitter at all! I almost left the almonds out, and now I'm glad I didn't. It adds needed texture. Biscotti is normally enjoyed with coffee, but this version naturally pairs with tea. 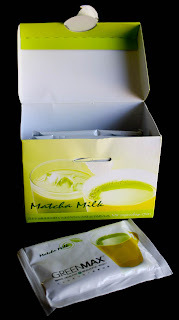 I'm including a picture of the Matcha Milk box because it could be difficult to spot. I nearly missed it myself because I did not realize there were 2 (and a half!) tea aisles. 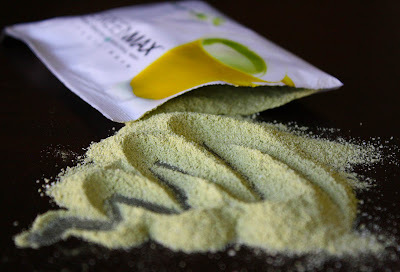 Jen from the gregarious homebody tried the recipe with regular matcha. You can find her version with suggestions here. Needless to say, I took more than matcha tea home. I'd highly suggest picking up some Yuzu Citron Honey Tea, too. A Vietnamese artist/friend gave me a jar of the jellied concentrate years ago when I was suffering from a sore throat. It is packed with vitamin C and the honey is so soothing. Preheat oven to 325 degrees. Line a large cookie sheet with parchment and set aside. In a mixing bowl combine flour, baking powder and matcha. Set aside. 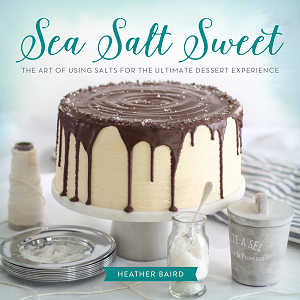 In a mixer with paddle attachment, beat butter and sugar together until light in color. Beat in the eggs and vanilla. Lower the mixing speed and slowly add dry ingredients. When dough is thoroughly mixed, add ginger and almonds. Mix on low speed until add-ins are distributed. Divide dough in half and shape each portion into a log, about 12”long. Flatten with hand and shape into a rectangle with rounded edges. Bake for 25-30 minutes. Remove and cool for 5 minutes. Using a serrated knife, cut slices into 1”portions. Bake again for an additional 10-12 minutes. Cool completely on a wire rack. Store in an airtight container. Happy 2010 to my readers, commenters, lurkers, emailers, and everyone who stopped by in 2009. You really made my year special. I can't wait to see what delicious things the new year brings to us! Wow, very innovative! Sounds very sophisticated, but tasty! Love your photos! YUm!!! 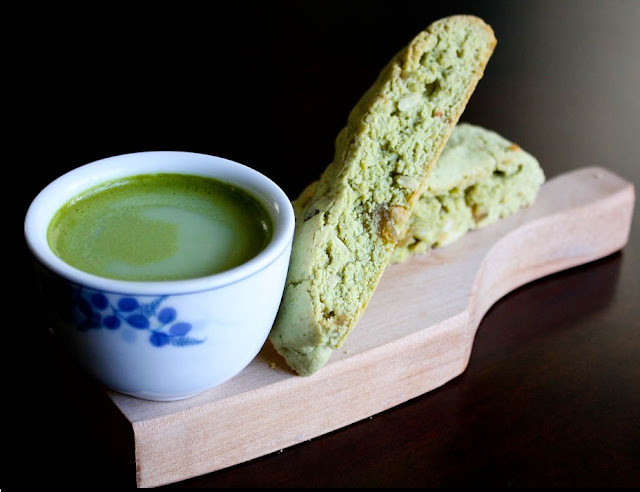 I love both green tea and biscotti. This looks like a match made in heaven. I am going to have to look for that matcha green tea powder, I would love it! Gorgeous pics!! Way to go! A great win! I live in a small town and can't get the matcha milk here. Hopefully I'll get a chance to visit an Asian market I know of soon. Do you have any suggestions on making our own mix from matcha tea and creamer? Your pictures are lovely. Hi Lorrie, funny you mention this, I have been pondering this recently. The Matcha Milk appears to be an even mixture of non-dairy creamer and matcha(1 part mixed with 1 part)but I don't know for sure. It's also very lightly sweetened with sugar. I'll have to experiment a bit to see if I can get a close copy. I'll definitely let you know! Thanks for asking! omg i want to make these right now!!!!!! i'm drooling! simply wonderful! I miss those matcha milk, impossible to buy in my country. 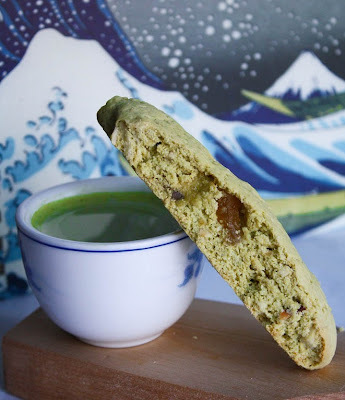 Sigh...love the matcha milk biscotti idea :). i just made these!!! i cant wait to try them out, what a brilliant recipe :)! I really think that would be so good to prepare this recipe, I know that everybody at home will be pleased to taste it, even that my family has a very exhaustic sense for eating. These look awesome! I can't wait to try these out tomorrow! How do I omit the butter, as traditional biscotti recipes do not require it? Thanks for bringing this to my attention! 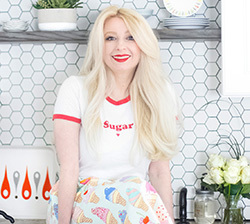 I had no idea the recipe wasn't viewable (time to check other old posts!). 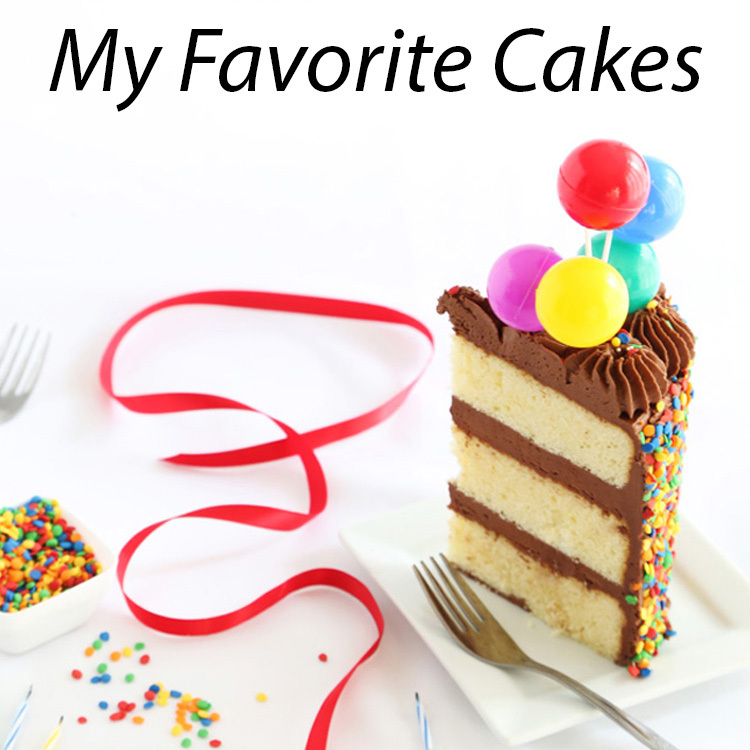 I've added the printable recipe to the post.